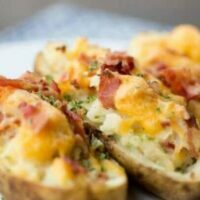 Easy, cheesy, loaded twice baked potatoes are a family favorite recipe in our house. Our family loves this easy, savory baked dish. It’s the ultimate quick and tasty savory side that is also hearty enough to be a meal. You can make ahead of dinnertime and pop them in the oven before serving for a fast and healthy dinner or side. Talk about a simple, filling meal! Our gang thinks they’re the best. They can be loaded with bacon, with cheese, with broccoli or with jalapeno. They also taste amazing with chili on top. There are endless topping possibilities. Top with fresh sour cream before serving and you’ll be in love. I don’t know about you, but I love potatoes. I love them in any form: mashed, baked, french fried, scalloped. I especially love a good twice baked potato. When it comes to serving, you can cater them to each person’s likings. The kids especially have fun with this because they get to create their own potato with their preferred toppings. The only rule is they have to be cheesy. We love to add cheese to our twice baked potato mixture as well as sprinkle some extra cheese on top. We believe the philosophy that says, you can never have too much cheese. What is a twice baked potato? 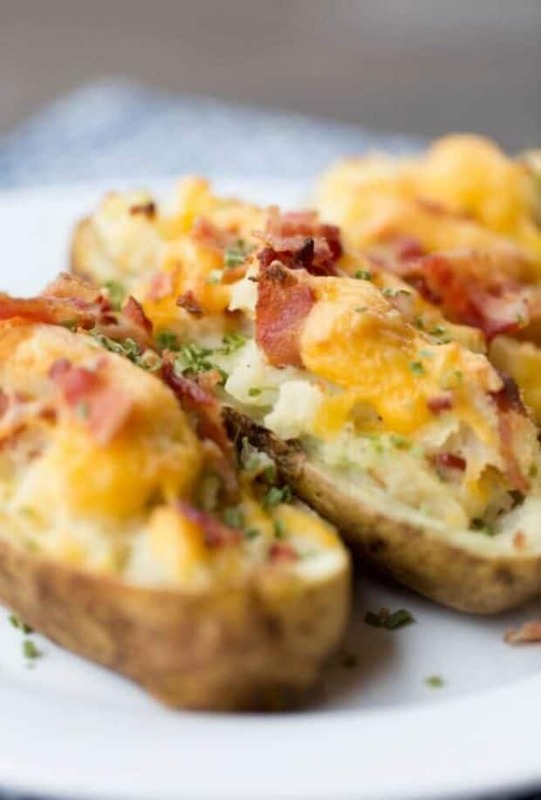 Much as the name suggests, a twice baked potato is a potato that is baked two times. 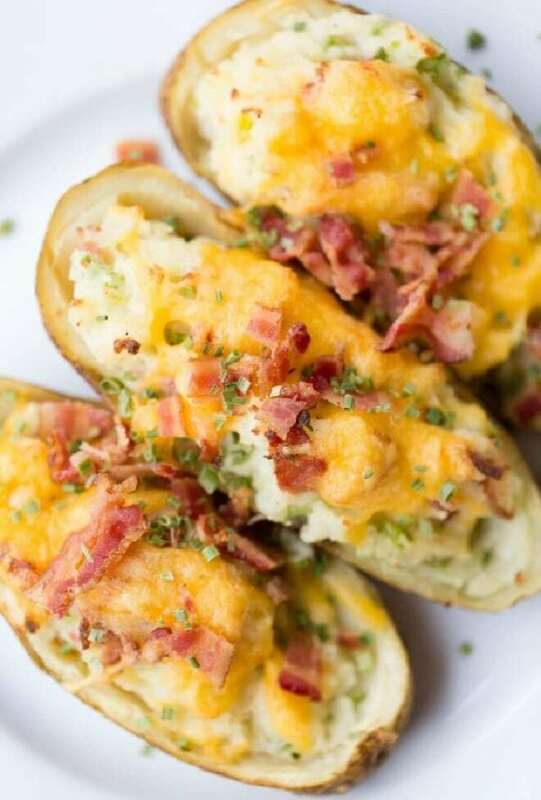 But when you see the final product, twice baked potatoes look so amazing. They look like something much more than a potato that was simply baked two times. A twice baked potato is a potato that has been fully cooked in the oven. Once cooked, the potato part is removed which leaves the skin as a sort of boat. The potato is then mixed with whichever ingredients you like and put back into the boat shell. Then, you bake it a second time. The beauty of having two steps to baking is that you can break it up. If you have limited time, you can make the potatoes ahead of time, do the first bake, and get them ready to be baked a second time, later. Before starting the preparation, you’ll want to preheat the oven to 425 degrees. Next, wrap them separately in foil, poke a few holes in each potato, and bake them at 425 for 45 minutes to one hour. When the potatoes are cooked all the way through, remove them from the oven and allow them to cool. If you plan to bake the potatoes for the second time immediately after the following steps, you will want to leave the oven on, but you can turn the temperature down to 350 degrees at this point. Then, slice each potato lengthwise and scoop out the inside. Be sure to leave about a 1/4 inch border around the skin. Place the insides of the potato in a medium size bowl. Then, scoop the potato filling back into the potato skins and sprinkle with the remaining cheese. At this point you can wait to bake a second time. This is a great option because it allows you to prep the meal beforehand and have it ready to go for dinner or whenever you will be serving the potatoes! 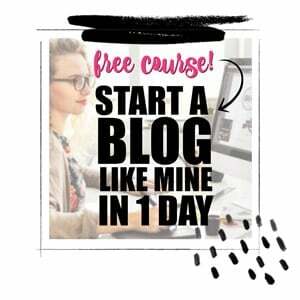 Or, if you’re doing it all at once you can proceed to the next step. Bake a second time at 350 for 15 minutes or until the cheese is bubbly and brown. When finished, sprinkle them with the remaining bacon and chives. Serve with sour cream and any other toppings you prefer. The sky’s the limit for the types of toppings you can put on twice baked potatoes. This is a fun recipe that allows you to keep it simple and easy, or get super creative. 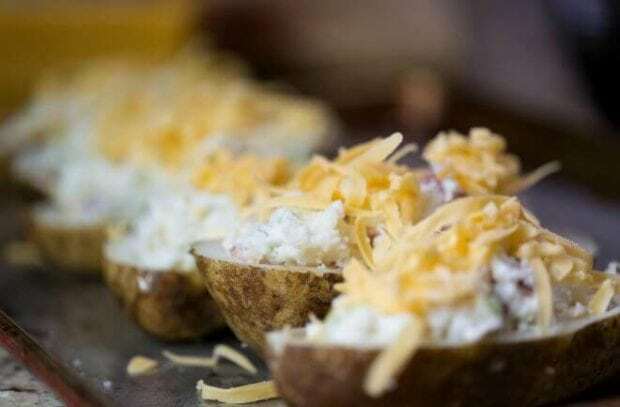 You can always keep the toppings on the side and let people add what they like to make their very own loaded twice baked potato – which works great for parties, watching Super Bowl and other celebrations where you need easy food ideas. 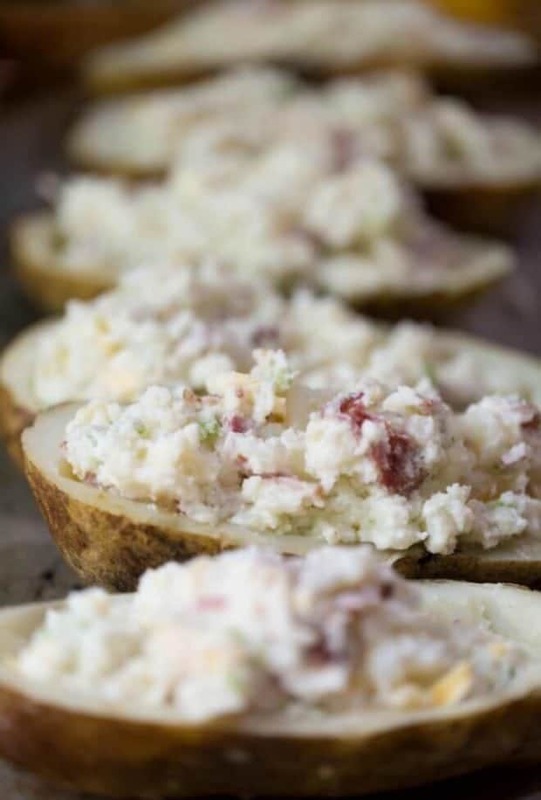 If you’re looking to make a complete meal out of the twice baked potatoes, we recommend adding a protein! We love adding crab, chicken, or sausage. If you prefer to keep it vegetarian, I recommend to go for cooked broccoli or cauliflower! They make a delicious addition to the potatoes. One thing you can do when making twice baked potatoes is prepare them in advance and freeze them for later! Or, if you’ll be heating them fairly soon, just keep them in the fridge. I love to make a big batch when I cook these, and make some for now and freeze some for later! To reheat them, take them out of the freezer and place them on a cookie sheet. Preheat the oven to 350 degrees. Brush them which a bit of melted butter. Then, bake them for 20-25 minutes. Keep an eye on them. When you see the cheese getting brown and bubbly take them out! One thing is for sure, twice baked potatoes are a fan favorite. They are easy to prepare and even to save for later. Best of all, they are so versatile! You can switch them up a bit every time you make them. I, for one, can’t get enough. Our family loves this easy, savory baked dish. It's the ultimate quick and tasty savory side that is also hearty enough to be a meal. Wrap in foil and bake at 425 for 45 minutes to one hour. When cooked all the way through, remove from oven and allow to cool. Slice each potato lengthwise and scoop out the inside and place in a medium size bowl, leaving about a ¼ inch border around the skin. To the scooped potatoes, add sour cream, milk, and melted butter. With a mixer, mix on medium until potatoes are creamy. Stir in jalapenos, half the cheese and half the bacon. Scoop the potato filling back into the potato skins and sprinkle with the remaining cheese. Bake at 350 for 15 minutes until cheese is bubbly and brown. Sprinkle with bacon and chives.